"This is the first art course I've every done and I enjoyed every second of it. The 'classroom' part at the beginning of each day was extremely interesting and informative. I feel I learned about colour and tone and recognised the value of thumbnails!! John is a great teacher, explained things very clearly. He was helpful and encouraged everyone." In June the Schoolhouse for Art welcomed back artist John Dinan. 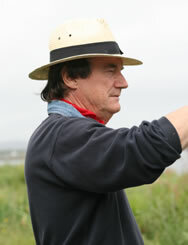 John taught a 3 day Landscape sketching and plein air workshop. The group were based in the Schoolhouse and spent some time in the village around the clock tower , the church and the Powerscourt estate. Overcome any fears you might have about sketching and painting outdoors in this interesting and really enjoyable workshop. Using both drawing and painting techniques, which will be demonstrated beforehand, you’ll work both in landscape and village-scape settings, with one-to-one guidance throughout the day on location (weather permitting). In the daily studio session before we head outdoors, we will cover basic sketching techniques, simple watercolour demonstrations, important ways to improve your drawing and keys to good composition, among many other issues. While outdoors, John will demonstrate these techniques as well as advise each participant on a one-to-one basis, depending on their level of experience. These workshops can book out quickly so book soon if you’re interested. His landscapes, portraits and still life's are held internationally in corporate and private collections.